It is necessary to differentiate between pain in the lower back and pain, which radiates down the leg. It is common for the layperson to combine them into one category, but to a physician or surgeon, they represent different pathologies. Low back pain is not due to the pressure on a nerve root, as lower extremity pain is. Most low back pain is muscular or mechanical in nature, caused by overexertion, overuse, strain or sprain of the ligaments and tendons of the low back. It may also be attributed to degeneration of the disk space and facet joints, which hold the spine together. It may be caused additionally by arthritis or stenosis or referred symptoms from organ involvement (bladder, gall bladder, kidney, prostate). One must also rule out organic causes as any form of cancer, especially prostrate CA. Lower extremity (leg) pain is often seen to radiate, termed "radicular pain." This refers to pain which shoots down the leg, from the low back or buttock. It usually results from pressure on a nerve, which produces a ”pinching” of the nerve, which appears to radiate down the leg in the distribution of the nerve pattern. When the "pinching" of the nerve is mild, one may experience numbness or tingling. As it progresses and becomes more severe, pain may develop. Further progression may present actual damage to the nerve and weakness may also result. Each nerve in the lumbar spine has a specific pathway. The nerves also carry three distinct characteristic properties. They carry all three of these properties to specific parts of the leg and foot. One characteristic is known as the sensory distribution property. What this means is that a nerve will supply the sensory (sensation) property to a certain part of the leg. For example, the S1 root, which is the first sacral root, supplies sensation to the lateral aspect of the foot (little toe). One characteristic is known as the motor function property. What this means is that each nerve also supplies a characteristic muscle. The S1 root supplies the calf muscles (gastrocnemius), which allows each of us to stand on our toes. One characteristic is known as the reflex pattern property. Several of the nerves in the lumbar spine have a reflex associated with them. The S1 root has the Achilles reflex, which is elicited by tapping on the tendon of the heel. Neurogenic claudication refers to pain in the lower extremities brought upon by walking. This is often caused by pressure upon the spinal nerves within the spinal canal, usually the result of the disc bulging into the nerves when standing. Vascular or intermittent claudication is a type of pain, which must be distinguished from the leg, and lower extremity pain from above. Vascular claudication is due to insufficient blood supply to the legs (arterial insufficiency), and is also brought upon by walking. The difference between the two is that merely standing (without walking) can cause neurogenic claudication but vascular claudication can only be brought on by walking. Remember, one of the first obligations, as a physician is to arrive at an accurate diagnosis. If all match, then the treatment can be focused at the cause of the problem. The physician should thoroughly explain to the patient everything about their condition so the patient completely understands. Only them can the patient make the right decisions about their options and take an active role for their own recovery. 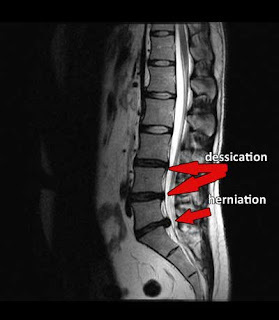 With decompression therapy, 86% of patients with herniated discs had relief of pain with recovery. Decompression is truly the most effective procedure for severe and chronic cases of bulging, herniated discs, degeneration, arthritis, stenosis and pressure on nerves. Decompression in non-surgical, drug free and the safest method for the treatment of severe low back available. It also offers the highest percentage of recovery, with most patients well or better.